When Henry Ford Jr. assumed control of Ford after his father's death, the handshake agreement with Ferguson fell apart. In response, Ford engineers made modifications to improve the ideas behind the original Ferguson hitch on a new model, the Ford 8N. 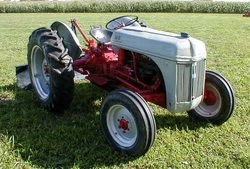 The 8N included refinements such as a four-speed transmission and a Position Control setting for the hitch's hydraulic system. Ferguson sued, and the settlement between the two required Ford to make modifications to its hitch. The Ford 8N was so well-built that many of the units are still in use today. This model incorporated a 30-horsepower, four-cylinder engine with a four-speed transmission. The 8N implemented an improved steering system that required less effort to operate, Position Control for the hitch and featured both brake pedals on the right side.